The streetscapes of D.C. could bring beauty and benefits to our neighborhoods if only their potential was realized. The Planning & Design department looks at some of the rough patches and then demonstrates “What It Could Be” if it incorporated bioretention that promoted the growth of large shade trees. The most recent stretch of street to get a digital makeover is 2100 Martin Luther King Jr. Ave. SE. The drawings shows two different streetscapes, the current one on above and the imagined one below. 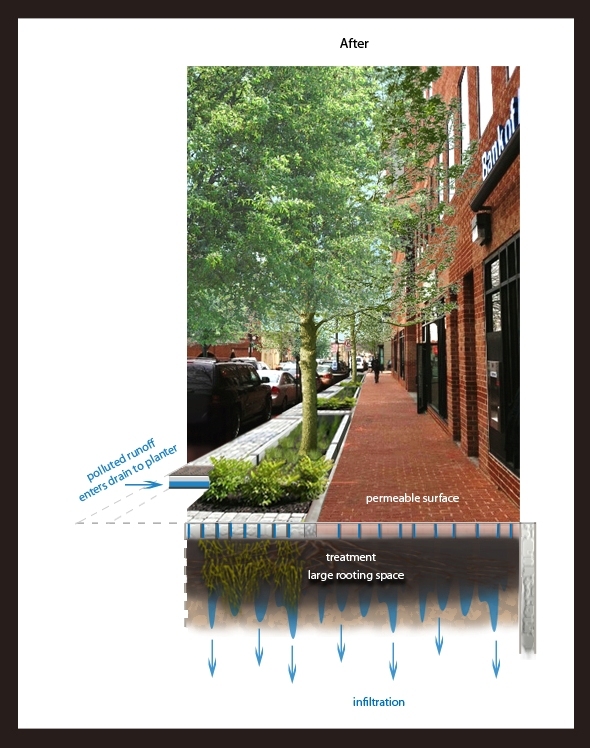 Notice the before design constrains roots whereas the after design gives larger trees more space for their roots, in turn preserving the sidewalk, encouraging growth and making streets biodiverse. The extra soil space allows for stormwater capture, which removes pollution and helps prevent dirty water from entering our waterways. 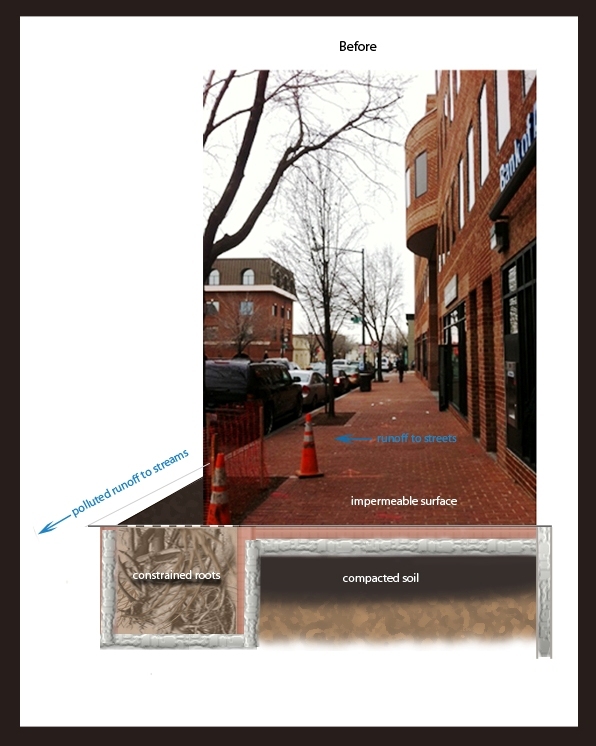 In many street boxes in the District, like those in the photograph on the left, additional vegetation impedes on a tree’s root growth and sends polluted water to the river through the sewer system. “What It Could Be” is a new recurring feature in our e-newsletter, The Leaflet. Subscribe to The Leaflet to catch stories like this one and more. Will the depressed area be a hazard for infants and the elderly? How can you prevent it from collecting debris and becoming rodent infested? Thanks for the questions! You raise some important concerns. First, these design techniques are compliant with the District Department of Transportation regulations and the Americans with Disabilities Act, which are both designed with safety and accessibility in mind. The sidewalk is 6 feet wide, which should allow enough clearance to prevent anyone from falling in. The curb provides an additional safeguard, and a taller fence could be added, if needed. Trash will always be an issue in urban areas as long as people litter. Like any landscaped area or tree well in the city, the space would have to be maintained. Bioretention areas are not hospitable places for rodents to breed since they are wet on a regular basis. These designs have been used in urban environments all across the country, including DC, and rodents have not been a problem. Thanks again for the inquiry! (tomatoes, peppers, potatoes, etc) as well as azalea plants. My personal experience taught me what tanin can do to potatoes and tomatoes. My peppers did pretty well. Last Chance to Vote for Casey Trees! Today, Casey Trees Turns Ten! Tune in for Tree Talk Thursday Tomorrow!